The celebraties of universal history. Series n°5: The French Revolution and the wars of independence. 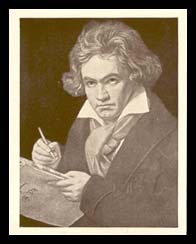 Ludwig van Beethoven, one of the greatest ever composers, was born at Bonn and lived in Vienna. His life was tragic, due to an illness in his ears which left him deaf by 1819. His piano sonatas, his string quartets, his 9th symphony and his opera Fidelio are immortal. Actual size of card: 6.3 x 5.3 cm. The glorious events of German history. Series n°7: The Germans of 1800. As Beethoven and Goethe meet the royal family at the thermal spas at Teplitz, Beethoven continues walking without stopping. Goethe steps back to let pass the royal patients, his hat in his hand. Actual size of card: 5.3 cm x 6.3 cm. 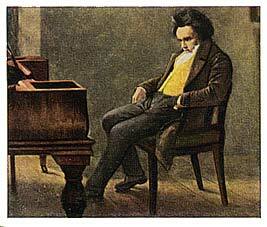 Beethoven, one of the greatest geniues of all time, left in solitued with his artistic creation. It is tragic that this master of music should have endured a growing problem with his hearing, which led to complete deafness. Actual size of cards: 6.3 x 5.3 cm. This card was produced in 1899, in England for the Ogden company. It was on offer with packets of 10 Oden cigarettes. The card is numbered 57 of 200. The series was entitled "General Interest". 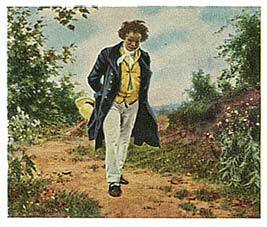 On the back of the card is marked: "Beethoven, composer of many sonatas, symphonies, masses... Born Dec. 1770. Died March 1827". There is nothing on the reverse side. Actual size of card: 4 cm x 6 cm. This second card from Ogden is numbered 51 from the series entitled "New Series 1". Actual size of card: 3.6 cm x 5.6 cm. This card was produced in Marocco, in 1961, by the British American Tobacco Co. Ldt. The card was on offer in a packet of Domino cigarettes. It is numbered 22 in a series of 25 cards entitled "Historical figures ". Actual size of card: 3.2 x 6.8 cm. Card number 139 from the series "Gestalten der Weltgeschichte"
It is numbered 139 from a series entitled "Gestalten der Weltgeschichte" (People from History). The reverse of the card is in German, and explains the series. Actual size of card: 7 cm x 10,5 cm. This card was produced by W. D. & H. O. Wills Ltd in 1912 and could be found in packets of their cigarettes. This was the fifth in a series entitled "Musical celebrities". 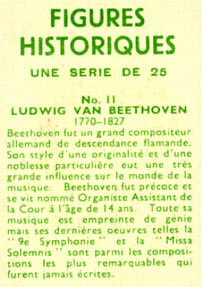 The front side depicts the composer and the reverse is a short biography. Actual size of card: 3.6 x 6.8 cm. This card was issued in South Africa by Kentucky Tobaccos (Pty.) Ltd. in 1940. 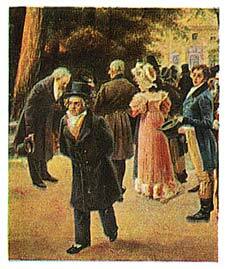 It is card number 60 from a set a set of 120 cards entitled "The March of Mankind". 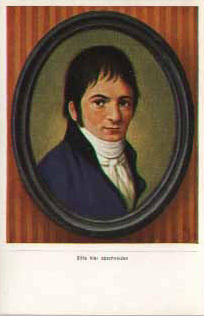 The front of the card shows an artist drawn representation of Ludwig van Beethoven, while the back of the card carries the series title, card number and an album 'offer' (text both in English and German). The card was given as a free premium with the purchase of a pack of 20 cigarettes. Actual siwe of card: 6 cm x 7.5 cm. 2 - Card from the Zigarettenvertrieb, dated 1934 from Dresden. 2 Card from the Zigarettenvertrieb, dated 1933, number 9 out of 200 from the series 'Schoene Deutschland'.